I was very excited when I received Playing the Part in the mail. It is the third and final book in her latest series. This book is the story of Lucetta Plum, an actress from New York who has to leave the city to escape the intentions of an over eager fan. Her escape lands her at the estate of Bram Haverstein, the grandson of her benefactor. Bram is also an admirer of Ms Plum, although he does not fully understand the mysterious depth of Ms Plum's personality. Lucetta's initial impression of Bram is also wrong, as his intriguing and somewhat distressing at times facade also hides mysteries for which Ms Plum is unprepared. The tale that follows is full of mayhem, romance, and adventure as they both work to protect Ms Plum from danger. I am unsure how Mrs. Turano does it, but her female heroines are always hilarious and strong. These heroines are always a good match for their stronger yet tender counterparts. My favorite part of the novel is the magnetism between Lucetta and Bram. They are drawn to each other, but they are unsure how to approach the other because of the questionable qualities that don't quite up between the two until all their secrets are out. As a reader, I too was drawn to the characters as I tried to figure out what was going on in the book. It makes for a very great read, and made it hard for me to put the book down until I finished it. This book is a great read for anyone who enjoys historical romance with a little mystery thrown in. This book can be read as a stand alone novel, but I would recommend reading the other two books first. It would help with understanding Lucetta's character and story. I've read the Gopsels and know the accounts of the resurrection from the Believers, but I'd have never thought to look at it from the view point of a Roman Tribune. If you have watched TV or even checked social media these days, surely you've heard about the movie Risen. Well, it is in book form as well, and I just finished it. Angela Hunt wrote the novelization of the movie and I have to say it was very well written. It is a fictional account, but it contains many actual facts from the Gospels. It is very different to see the story told from the viewpoint of one who is a very strong adherent to Roman life with the aspects of Old Testament law from the San Hedrin who were trying to keep the story hidden. The novel switches between first person accounts of Clavius, the Roman Tribune, and Rachel, a Jewish woman. Clavius was present at the crucifixion and is sent by Pilate to investigate the reports that the Nazarene's body has disappeared. Rachel is not involved directly with the investigation but through her relationship with Clavius and business in the temple and in Jerusalem, she is taken along on the journey. And what a journey it is! I watched the movie too, but the book adds so much more. The book tells a very vibrant and rich account. Everyone needs to read this book. "With This Ring" gets a YES from me! Every once in a while, there comes a time when several of your favorite authors have a new book out and you have to choose which one to purchase first. Well, With This Ring will solve that dilemma for you. This book is a collection of four novellas from some of the best names in the business, in my opinion. In this book, we get introduced to new characters and reintroduced to characters we have met before. Karen Witemeyer brings us the story of Marietta and Daniel, with her usual penchant for a sweet and strong female and a tough yet tender hero. That is followed by the always hilarious Regina Jennings' tale of a couple caught together by the weather while having to deal with the flood of their feelings for each other and a seemingly dangerous stranger. 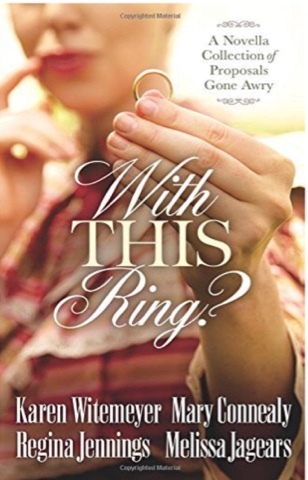 Mary Connealy pitches in with the story of a woman running from an unwanted engagement only to find herself with a very wanted protector. Melissa Jagears finishes up with Charlotte and Harrison, who literally and figuratively have tonovercome the inability to see what is right in front of them before they lose what really matters. Each story is a small yet satisfying taste of what each of these authors can do. If you have never given any of these authors a chance, this book is an excellent introduction. Even if you have tried them before, this book is the right choice to help make the wait between books a little easier to bear. I really enjoyed these stories and I know you will too. Until the Dawn is a sure hit! I have come to highly anticipate Elizabeth Camden’s novels. Ms. Camden has a penchant for combining history with scientific breakthroughs from around the same time period into captivating depictions. Some authors take the same story line and change it up a bit but not so with Ms. Camden. Each of her novels is a new and fascinating take on history. Her latest novel, Until the Dawn, tells the story of Sophie and Quentin. Sophie is a volunteer for the Weather Bureau who has set up a weather station at one of Quentin’s family homes, Dierenpark. Aside from a few servants set to keep watch, Dierenpark has sat vacant for many years. Quentin has come to Dierenpark on a mission from his grandfather and is accompanied by his young son. Sophie and Quentin are at odds from the first, separated not only by their visions for Dierenpark, but also by social and economic statuses and different spiritual beliefs. They are drawn together by the needs of Quentin’s son and strange occurrences at Dierenpark. Ultimately throughout the book, they are drawn together by more than just Pieter but I’ll let you read for yourself to find that out. Although this is considered as inspirational romance, there is so much more to the book that just romance. The reader is taken on a journey to find out about the beginnings of the weather bureau, and also discoveries about the history of the place. Great new book by a new author! I love regency romance, and I loved this regency romance. 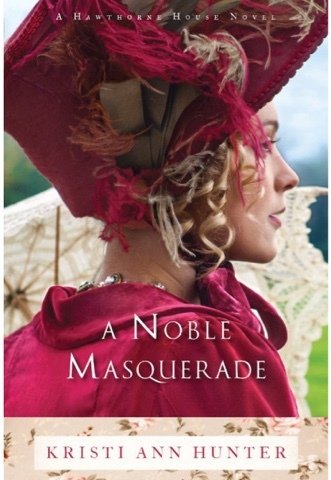 A Noble Masquerade is the debut novel by Kristi Ann Hunter. (There was a novella before this book that I completely missed – however I have downloaded the novella and it will be my next read.) This delightful book tells the story of Miranda, who in lieu of a journal, has been writing her most secrets thoughts in letters to her brother’s longtime friend, the Duke of Marshington. She keeps most of the letters locked away, but when her brother’s valet accidentally mails one to the duke. To her chagrin, the duke writes her back and the adventure begins. What follows is a whirlwind of crazy and imaginative accidents and coincidences. Miranda manages to get herself into some comical situations, but she also has some very sensitive moments. She is about to enter her fourth Season, and feels like her younger sister will outshine her. She feels held back by the strict “Lady” rules her mother has placed on her all her life, and does not know how to let her real self shine through, except through letters to the duke. When Miranda and the duke finally meet, she still holds herself back. The Duke, (Marsh as he is called), is not what I expected at all. Marsh has been hiding himself too, although not in the shadow of a sibling. He has been out of the public eye in service to his country. It was interesting to see how Ms. Hunter bent the societal rules of Regency England to bring Miranda and Marsh together. Marsh has to work around his “career” and Miranda has to work around her character, so together they can both be the best they can be, together. This book is a good choice for anyone who enjoys regency romance. There is a little intrigue included, towards the middle of the book. This added extra to an already good storyline. I look forward to what Ms. Hunter will bring us in the future. 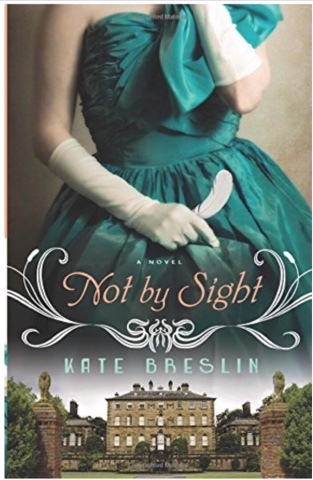 Not by Sight, the latest novel by Kate Breslin, is the story of Grace and Jack. Grace is an intelligent, independent woman who wants to do whatever she can to support the war effort. Her efforts are what first brings her into contact with Jack. Grace doesn't think that Jack is doing his part to support the war effort, but eventually finds out differently. Their first meeting was on purpose, their second meeting by chance. What follows is an "intrigue"-ing story of mystery and romance in England during World War I. It took a little bit for the book to capture my interest, and when it did, I was not disappointed. Once I got going in the storyline, I read until I had finished the book. The historical research completed by the author is a major ingredient of what kept the story moving along. There were also spiritual themes through out that also added much to the story. It's refreshing to read a book that not only adds to the reader's historical knowledge but also inspires their faith. I really identified with Grace's desire to help all she could even while in situations where she was unsure how to proceed. Her faith in God and her support of those around her was a good theme throughout the book. I could also identify with Jack's refusal to have anything to do with things related to the faith, especially with the situations through which he had gone. It's not always easy to keep trust and faith in God when it's impossible to see where the road is going. Of course, even Grace goes through difficult times in the book. This was the first book I had read that was written by Kate Breslin, and it definitely will not be my last. The intrigue mixed in with the romance was just the right mix for a great story. If you like historical romance and intrigue, then this is a good choice for you. This book is the 2nd volume in the series but was the last volume published. Drs. Nathan Holsteen and Michael Svigel are both professors at Dallas Theological Seminary with extensive backgrounds in theology. Please note: this was my first introduction to this series. It is broken down into several sections for easier reading. One section goes over passages of scripture relating to the subjects of the book and highlights how these scriptures were used as the basis for different theological beliefs over the span of history. The next couple of sections highlight the important facts that are the foundation of our belief system and certain areas that that can be dangerous to us in our Christian walk. The last section provides direct examples of leaders and confessions from the past that supplement the scriptures and time periods that were previously discussed. I really liked how the book was set up. It makes it easier for those who are new to Christianity and/or theology to get their feet wet a little bit at a time without getting in over their heads. The book discusses subjects that are beneficial to Christians in any level of their spiritual walk. The subjects and examples use will allow the reader to reason through their beliefs and help them understand why they believe what they do. This is a great way to introduce people to theology.